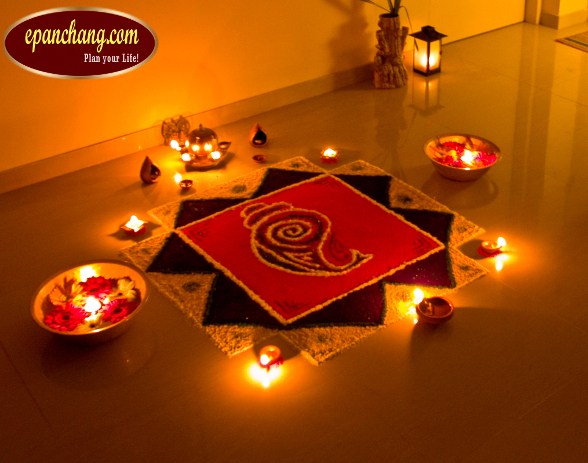 Diya and Lighting, Home decoration, Shopping, Fireworks, Puja (Prayers), Gifts, Feast. Deepavali is the festival of lights. This occurs in the month of October, November every year. It is one of the popular festivals in Tamilnadu. This is a festival that has been celebrated in Tamilnadu since the past six centuries. It is now a part of the culture of Tamilnadu. On the Deepavali day, it is usual for the family to get up very early in the morning, get an oil bath, wear new clothes and light fireworks. The entire city is a colourful sight during the early morning and in the night. Deepavali is a national holiday all over India. It is a day when the poor and rich both celebrate alike. The celebrations are more in joint families, even though they have become rarer through the passage of time, where everybody pools in and buys gifts, sweets and crackers for kids and one another. Deepavali is celebrated for various reasons all over India. In Tamilnadu, Deepavali is a festival where the celebrations are for the victory of Krishna over Narakasura. Another school of thought says that this was the day when Lord Rama returned from Vanavasam at the end of the 14 years. The path of his return were lit by lamps all through and celebrated with fireworks by the people of Ayodhya to welcome Sri Rama.